The Return of the Tuning Forks! One mark of a good layout is when it continually calls you back with new ideas and new additions. Often these “second thoughts” are both imaginative and inspiring. So occasionally we offer you a page that describes new developments on layouts we’ve all seen before (either once or several times). Here’s a current crop of additions to familiar layouts, viewed “One More Time” and providing us some more inspiration to spur our own efforts! 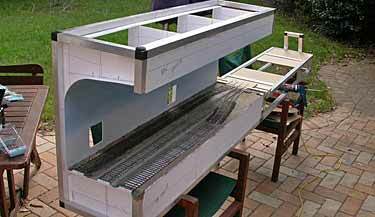 ChicagO Fork is an ingenious O-scale switching shelf that first appeared in Scrapbook #97a. 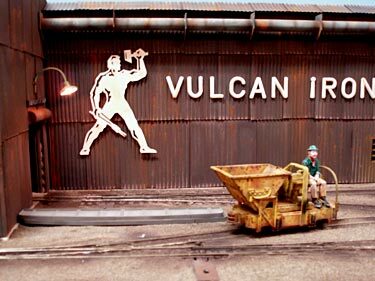 It was built by Prof Klyzlr, a well-known pseudonymous modeler from Sydney, Australia, in response to a challenge from a local O-scale group to “build a so-called micro layout that will handle full-sized U.S. equipment in O scale!” The result measures 1x4ft (30x120cm) plus a four-foot (120cm) extension with a hidden sector plate. It can use husky diesel road switchers and both 40- and 50-foot Hi-Cube boxcars. Carl Arendt then drew up an HO-scale version of the layout, ChicagHO Fork (see Scrapbook #98a). The pocket version measures 24x6in (60x15cm) with a 24in (60cm) fiddle yard. Now Prof has actually built the HO version, and displayed it side by side with the O-scale layout (now owned by someone else) at an exhibition late last month (photo above). The HO version has several new developments, most notably its lighting, contained in the ceiling of the “monobody” baseboard/backboard design that Prof uses. After much experimentation, he settled on gimlet-mounted halogen lighting fixtures, and used two of them in the HO design. The nuts and bolts of this solution are outlined in excruciating detail in the Small Layout Design forum on Yahoo! (you may have to become a member to read it. That’s free). Further, it has occurred to both Messrs. Klyzlr and Arendt that ChicagHO Fork is an excellent “beginner’s layout” for HO standard gauge modeling. 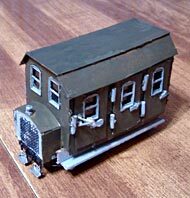 Requiring virtually no space and just one turnout, the little layout provides excellent prototypical switching opportunities, as outlined in Scrapbook #98a. Prof, who had prepared some special “proto-nook” switching sessions for the exhibition, was disappointed that very few people had time to actually try out either layout. And no one could be persuaded to participate in the “head-to-head switching rodeo” he had planned, using both layouts in timed competition. Ah, well… perhaps they were intimidated by his personal skill at such operations. If you’re ever offered an opportunity to run trains on a Chicago Fork layout (any scale), take it! Or better yet, build your own! Will Ayerst, from London, England, unveiled his plan for Southwark Park in Scrapbook #101. 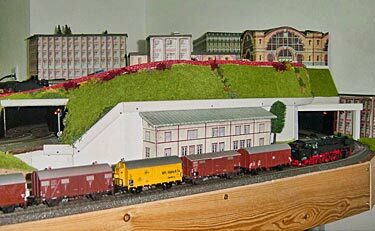 It’s a big-city passenger terminal in ScaleSeven (finescale O gauge with very large radii). The original design measured 15 feet long overall and was 9ft long in the visible central portion, where the throat is. Now, Will has been thinking about it, and found ways to reduce the center part to just 6½ft (see diagram)! How? By carefully adjusting switch placement, adding a lap switch and scrupulously calculating track lengths actually required. There’s not a lot of wiggle room in ScaleSeven! In Scrapbook #86a, Henning Stelter, a German currently resident in Portugal, introduced us to his work in progress, Hohlberg (“Hollow Hill”). He cunningly coiled a multi-track dogbone into a 183x105cm (72x41in) space in his laundry room. Now, after two house moves, he’s ready to show the layout in its nearly-complete condition. Principle scenic additions are all made of paper—buildings that have been printed via Henning’s computer, glued to art board, cut out and assembled. The “downtown” feeling of the Big City is much stronger now. And he’s been working on the operating patterns possible as trains chuff slowly up the Big Hill and zoom down it. 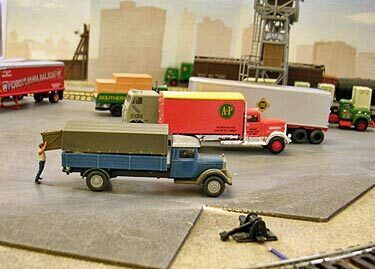 A couple of YouTube videos—here and here—give a good idea of the operations he can enjoy on this tiny metropolitan layout (video shot with an iPod camera). T H E R E T U R N O F T H E T U N I N G F O R K S! In the wake of last month’s article on Tuning Fork Layouts, Briton Trevor Perry sent the plan of his under-construction N scale scene from Col. Stephens’ light railway line, the East Kent Railway, which flourished from 1911 to 1951. Trevor has zeroed in on the area around Wingham (Canterbury Road), which served as the northern terminus of the line. A planned extension never happened, so the station sits in a cutting that extends 500 yards beyond the railhead. Trevor’s model station measures 4x1ft (120x30cm) with a 10-inch (25cm) cassette at the right end. Trevor explains the station’s appeal: “The really interesting thing about the operations at the terminus here was that ‘running round’ was achieved by gravity. The train would stop just short of the siding, loco uncoupled and pulled into the siding. The coach then had the brakes released and arrived in the platform by gravity. Sometimes goods trains were dealt with the same way. Another addition to our Tuning Fork collection is provided by Joshua Wolfe, from Pensacola, Florida USA. Josh needs a very small layout to use while he’s in college. 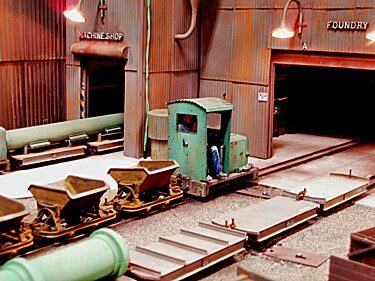 His solution is a 27x9in (69x23cm) Gn15 line, which runs from a mine (at left) to a very small port. The “middle part” is simply left out (represented by the blue diagonal line) with the imaginary distance between the two ends lost in a short forested view block. Long-time logging layout lover Lennart Elg, from Åkersberga, Sweden, has contributed a new large-scale Tuning Fork design. He explains, “I am currently planning a small logging shelf layout in On30, but I also have a set of large scale logging equipment from a previous project. When I came across the ‘tuning fork’ projects I decided to see what could be done in large scale, in my limited space (I first tried to design an Inglenook, but the third track left no room for scenery). 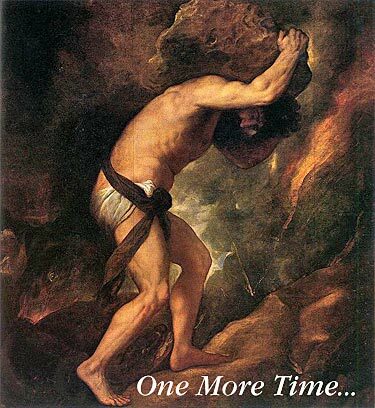 Sounds a lot like Paul Bunyan’s axe, which was as good as new after 50 years, having received only five new heads and 14 new handles during that time. But I think you’ll agree, Franck’s results are very appealing and appropriate. The layout measures 140x45cm (55x16in). Franck has an album of many more photos here. Inspired by the Harlem Station car ferry yard description in Scrapbook #88, Matthieu Lachance, from Québec City, Canada, has been working on “shrinking” the design as far as possible “without losing the general feeling and track arrangement of this very special terminal.” By using curved turnouts, a trapezium-shaped table and various other tricks, he produced this yard in a 66x45in (168x114cm) space—it retains compressed versions of all the original tracks and holds 42 cars (the original held only 55) plus a 10-car, 2-track movable car float used as a fiddle yard. We last visited “Shortliner” Jack Trollope’s work in progress, Harlem Station, in Scrapbook #96a. 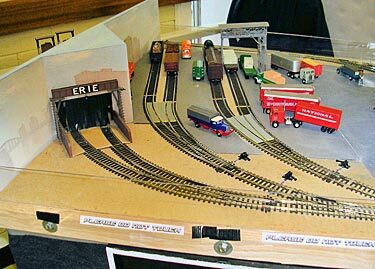 Jack’s HO version of the Erie car ferry yard in New York City is squeezed down to 46x28in (117x71cm) by leaving out a few tracks and drastically shortening the rest. He too uses curved turnouts to save space. Operation, however, is essentially exactly like the prototype. 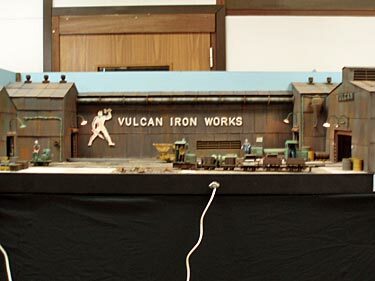 In mid-September, Jack exhibited the layout for the first time at the Inverness & District MRC Annual Exhibition in Scotland. The layout has reached the “detailing” stage, shown in these photos taken at the exhibition. 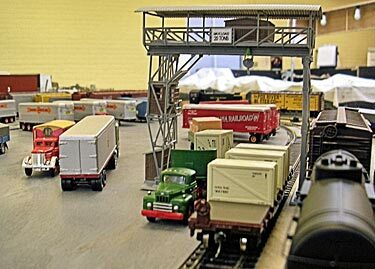 For more, see Jack’s thread at the Model Trains International Forum. Jack lives way up in the northern Highlands of Scotland. 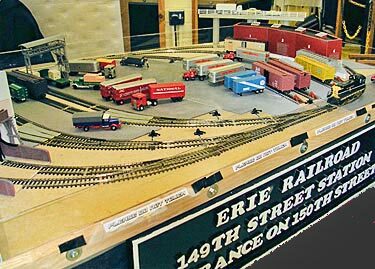 In case you missed it: The December 2010 issue of the U.S. magazine, Railroad Model Craftsman, has an Editor’s Notebook column titled, “Mini and micro layouts.” It’s an appraisal by RMC Editor Bill Schaumburg of minimum-space modeling in general, along with photos of several layouts, most of which have also appeared in these pages. This site gets a mention as well. This issue is still on the newsstands—see pp. 106-108. I am English I moved to Norway 13 years ago now, Married a Viking! He was kindness itself,and was both understanding and encouraging.He put up with my day dreaming and constant asking of questions no matter how dum and silly they were! 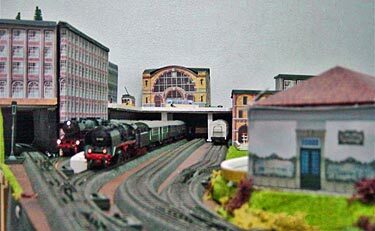 I myself have spent nearly 35 years in very poor health,I am Still day dreaming of owning a FIRST-CLASS Model Railway?but have never being able to contemplate building due to myr health. 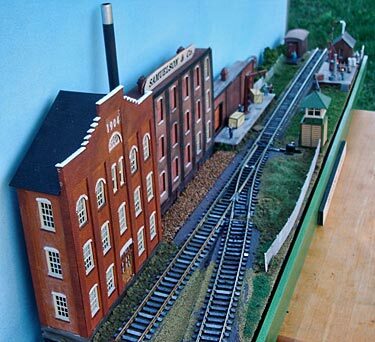 Maybe before much longer I may find someone who may take up the chalange to build for me a GN15 layout or similar?